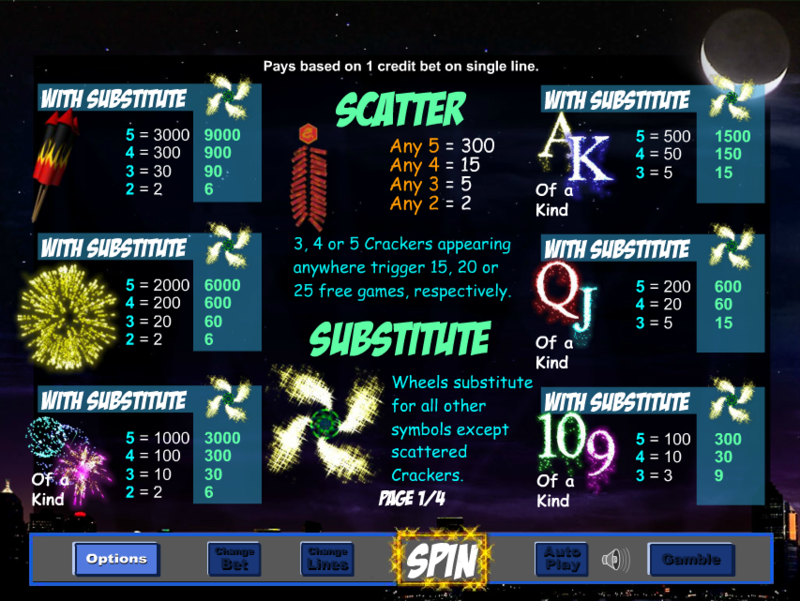 Strap yourself into the rocket and explode into the night sky in this slots online 5 reels, 25 pay line Firework Frenzy. Fireworks are enjoyed all across the world at New Year in China and on Bonfire night in the UK but every night is a firework display on this explosive slot game. 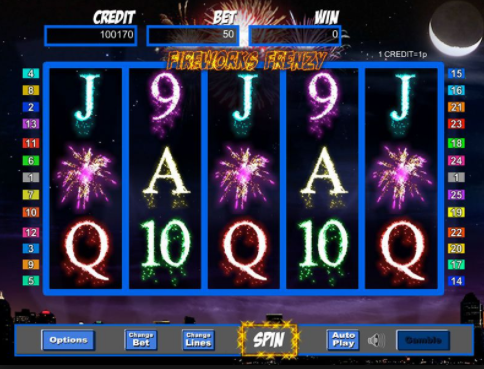 Fireworks Frenzy stays true to its name, the reels are ready to be spun by lucky punters out there, so prepare to light it up in this rocket of a game. Eyecon has a considerable lengthy history in the gambling industry which stretches all the way back to the beginning of the casino slot games betting revolution. Founded in 1997, Brisbane, Australia, Eyecon has been part of the movement which changed the way we placed out bets forever. They pride themselves on providing straightforward games with universally accepted rules and standards. Boasting over 100 slots in their portfolio, each designed to a high standard with stunning 3D graphics, animations and immersive gameplay. It’s Easy to see who this developer has stayed on top in such a competitive industry. Remember, remember the 5th of November with this explosive online slot game. 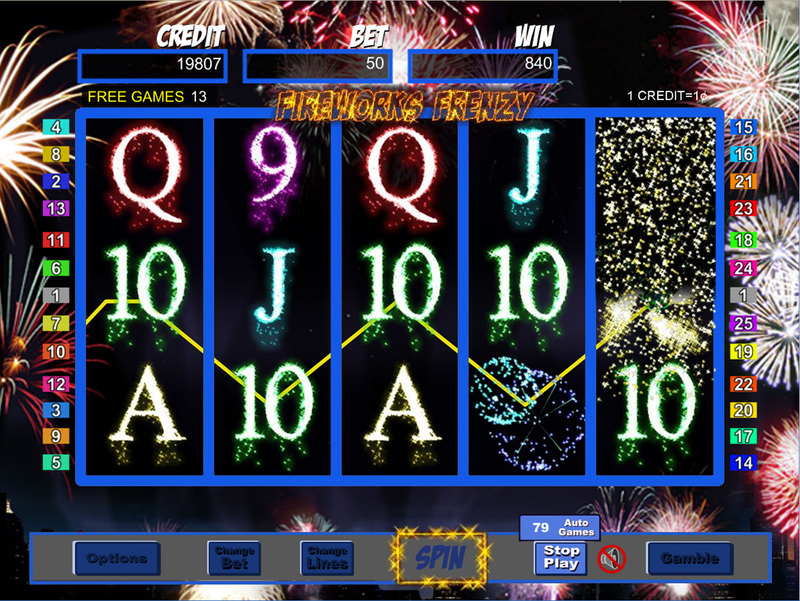 If you can’t wait until Bonfire Night you will love this firework themed online slot game. This online slot game features 5 reels, 25 pay lines, and you can light the fuse from 1p up to £25 per spin. The game is designed to be bright, colourful and explosive, guaranteeing you a display like you have never seen before. The reels and background are all decorated with colourful firework graphics that become animated in explosive displays. You can really feel the party atmosphere in this game. On the reels, you will see your classic card playing value symbols, these are the most frequent so they represent the lowest value. Following that you have a multicoloured explosion symbol, then a yellow explosion symbol and a set of rockets which represent the higher value symbols. The Wild symbol is the Catherine Wheel, and this will substitute for all other symbols in the game except the Scatter. If it forms part of a winning combination, it will triple the winnings for that bet. The Chinese Crackers is the Scatter symbol and will unlock the explosive bonus features in the game. 3 Scatter symbols will trigger 15 Free Spins, 4 will release 20 Free Spins and 5 will reward you with 25 Free Spins. During the Free Spins Feature the Wild symbol will expand and cover all positions on the reel, not only does this help you with your winning combinations but your prize will be tripled when you win! Get a free spins if you pay by phone slots. How can you possibly top off all that excitement? How about with a double or nothing Gamble Feature! As if you didn’t have enough action already, after every winning spin you also have the opportunity to play the Gamble. You will be dealt a card, and you have to choose the colour – red or black. Choose correctly and your winnings will be doubled. You could test your luck even further and guess the suit of the cards, guess correctly and your winnings will be quadrupled. However, if you pick wrong you will forfeit the bet, so think carefully before you light that fuse. Firework Frenzy’s theme is bright, vibrant and explosive. Literally, the animations start to explode and fizzle in a dazzling display right on your reels. Not only do you get to see a stunning firework display in the comfort and warmth of your own home, but you can take home some awesome cash prizes with the bonus features and gameplay in this exciting slot game from Eyecon. If you enjoyed Fireworks Frenzy you might also enjoy Piggy Riches online slots game.